Actor Robert De Niro swapped Hollywood for Halifax when he dined at an Italian in the West Yorkshire mill town. The star, best known for films like Taxi Driver and Goodfellas, ate at Ricci's Place before a "you talkin' to me?" moment in Leeds. De Niro later appeared at the city's Armouries Museum, where he was interviewed about his life and career. 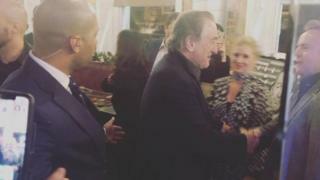 Restaurant owner Olivia Ricci said they could not get too star-struck, not wanting to keep De Niro waiting. Mrs Ricci managed to keep it a secret - even from staff - until just before the star arrived and kept service running smoothly throughout. The restaurant was closed to the public while he dined, on Monday. Mrs Ricci said she and husband Michael "only got asked about five or six weeks ago" to set the event up. "When we were approached and asked to put a menu together, we put it to his team and they liked the sound of it," she said. "We didn't even tell the staff, we just said we've got a private dinner for a special person. He was very humble and said he loved the food, he loved the coffee." The menu featured Italian charcuterie, artisan cheeses and bruschetta to start. Perhaps not surprisingly for the star of Raging Bull, De Niro followed with fillet of dry-aged beef and braised short rib, rather than venison, had it been more of a night for The Deer Hunter. Mrs Ricci added: "The dessert was a trio of New York cheesecake, Amalfi lemon tart and tiramisu." It's not clear whether De Niro's party was landed with a "raging" bill at the end. The 75-year-old actor, considered by many to be one of the greatest actors of all time, has won a host of movie gongs, including two Academy awards and a Golden Globe. Some of his most well-known films include Awakenings, Cape Fear and Casino. He is a restaurateur himself, with a string of hotels and restaurants around the world. It is the second visit to Yorkshire from a Hollywood star this month, after ex-wrestler Dwayne Johnson - aka The Rock - worked out at a gym in Doncaster last week.